In the 1920’s, The Midwest Refining Company was one of the largest employers, not only in Laramie, but in the state of Wyoming. They list – in many of the monthly editions of the Midwest Review – that “The Midwest family has over 3500 members.” The town of Laramie had a total of 6301 people according to the United States Census of 1920; Midwest Refining employed over 300 at that time. Needless to say, a town of 6300 with over 300 working for one company was fairly significant – as this doesn’t take into account the families of those employees. One of the most important questions this raises is, where did all of these people live? Where were their homes? 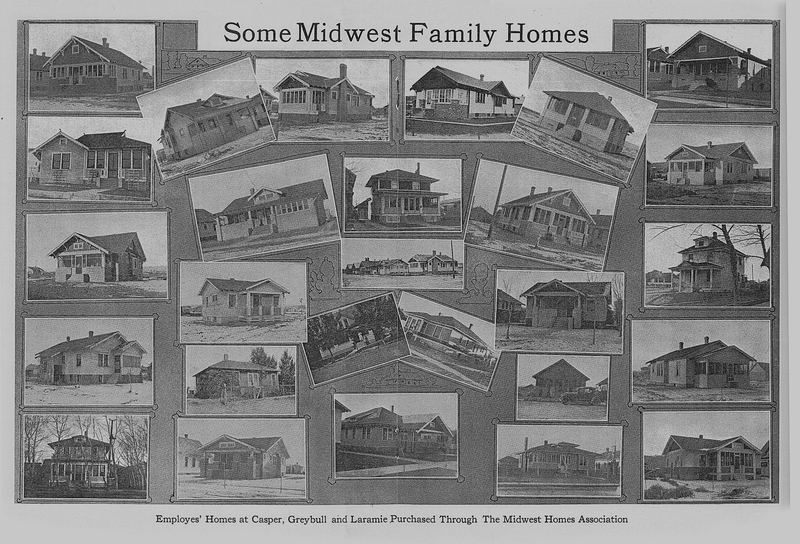 “Due to the fact that housing conditions were almost impossible in Casper, Laramie and Greybull, and it was imperative, if the Midwest Refining Company wanted to keep its men on the job, to help them produce homes, the Midwest Homes Association was organized by the department of industrial relations about a year and a half ago. The object of the association was to loan money to the employes in these three towns, to enable them to either buy or build homes. The operations of the association were of necessity confined to the three points, as conditions were considerably worse than in other localities. During the existence of the homes association 228 loans have been approved and close to a half-million dollars has been loaned to employes. A low rate of interest, 6 per cent, is charged on the loan and the borrower is allowed to repay his loan by very easy payments. The association requires no more of the borrower than is required by a building and loan association, and as a matter of fact the requirements are even much easier to comply with. All of the capital stock of the association has been loaned out and the only money available now is the amount which is repaid each month by the borrowers, which, together with the available interest, amounts to between $5,500 and $6,000 a month. The board of directors meets practically every month and approves loans for the amount of money on hand. Midwest employes have been enabled to build their homes in whatever part of town they desire, and many very pretty places have been developed by them. The places owned vary all the way from one and two room houses to six and seven room places. It is a noticeable fact that the men generally take the greatest of pride in their places and do a great deal of work toward fixing them up and making them attractive. So far the association has not been compelled to take drastic measures in the case of any borrower, with the exception of one or two. These were men who left the employ of the company and failed to meet their obligations according to the liberal terms of the contracts. Besides the 228 application which were approved for loans the board of directors of the homes association also approved seventeen other applications; these seventeen, however, withdrew their applications before the deals were closed up. Altogether, the board of directors during the time the homes association has been in existence has rejected sixty-four applications. Of the total number of loans approved and closed a total of thirty have been paid in full; ten of these paid up their applications because of the fact that they had quit the employ of the company; sixteen were transferred from one employe to another. This now brings the question: What homes still exist today that were built as a part of this opportunity? How many of the 228, (probably more), were located in these towns? If anyone who is reading this either knows or suspects that their home is one of these please email me at: info@docspix.com, or leave a comment below. I’d be interested in offering limited assistance with some of the research, and making photographs of your home today, (this is not limited to Laramie only – I’ll make the journey to both Casper and Greybull, upon verification). One of the most important criteria for this is the date in which the house was built; it must have been constructed no earlier than 1919, and no later than 1926, when the Midwest operations started to merge with the Standard Oil Company of Indiana. This is a scanned copy of pages 18 & 19 of the January, 1921 edition of the Midwest Review. There are a total of 27 homes pictured here. If you click on the image, it will expand to full size. There is no indication what town any of these homes are located in; just that these are in one of the three listed. But, many of these homes exhibit fairly unique architecture, so it may be possible to identify them. Again, if you know, or suspect that your home is one of the homes that Midwest helped to build, and would like to have a photograph of it published here, please email me at: info@docspix.com with “Midwest Homes” in the subject line. Or, as an alternative, please leave a comment below. If you include your address with your comment, I will remove the address before it gets posted to the comments section. Tony Hoch thinks that my house may have been one of these homes. It was built in 1924, *edited* contact me if you want to see it.